Pile on more weight as we show you the best way to phase in doubles and singles and attack weak points in your strength workout. Occupation: Co-founder of Beyond Strength Performance. Strength and conditioning coach and manual therapist at Ranfone Training Systems. When undertaking a program that focuses on strength rather than building muscle size, you don't follow a static program, which is to say you don't pick an exercise and simply do 3-4 sets of 10 for 12 weeks. When it comes to building strength, you need to build progression into your routine, a smarter and faster way to make gains. To that end, we're following up the first phase of the beginner's strength program (Weeks 1-6) with a second phase (Weeks 7-14) that builds on what you did previously. You can't get to a 315-pound bench press until you do one for 275 first, and this program lays the foundation for further gains. You do that by learning how to increase training intensity and developing assistance training that conquers weak points. In Phase 1, we determined your training max, set goals, and practiced the big lifts while employing 4 sets of 5 on your main lift. And while bodybuilding's high-volume, plethora-of-exercises extravaganza is enticing, for strength gaining we're avoiding it. Unlike bodybuilding, strength is a neurological adaptation, and to achieve it you need more rest and less volume. Each strength cycle typically lasts 12-16 weeks. While initial gains are often immense—increasing maxes by 5-10 percent is not unusual—gains tend to slow. Strength is an attribute earned by consistent hard work. Phase 1 brought us sets of 5 reps; during Phase 2 we up the ante and raise the intensity even more. We're traversing an outwardly ominous but increasingly fruitful landscape ripe with sets of triples, doubles, and singles. The human body progressively adapts. Once a lifter adapts to a stimulus, he or she need a stronger stimulus to further their gains. Such is the progression from higher reps to lower reps. The body requires an overload to adapt and then "supercompensate," or become stronger than it was before the overload. The sets of 5 aren't going anywhere—they always have a place in strength programming. 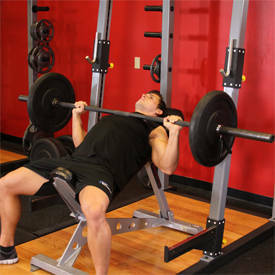 During this phase, you'll start with sets of 3 or 5 and progress to doubles and singles. While the body needs increasing levels of stress to adapt, introducing training stress isn't a linear process—it undulates. Starting each month with sets of 5 and 3, and finishing with doubles and singles, increases stress in progressive waves. Undulating intensity tolerates gradually harder training because the body has the chance to adapt before it is offered a stronger stressor. Notice how the progression through time doesn't go directly to your lowest-rep sets; instead it gets close, backs off, and comes back again to a point in which you're finally doing singles in Weeks 7 and 8. Remember, none of these sets consume your maximum effort. 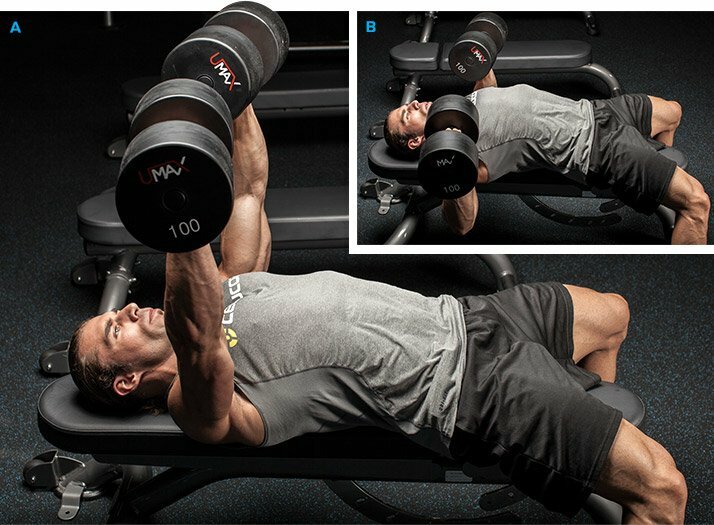 You'll have a rep or two left in the tank at the end of each set—even when completing the single sets. 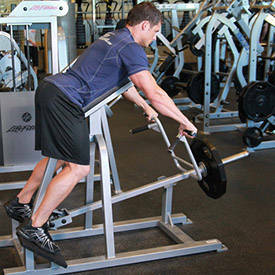 A strength competitor might aim to maximize his or her strength on all lifts simultaneously to peak for a competition. For the average gym-goer, it's best to specialize on just one of the big lifts at a given time, and to cycle those phases among the lifts. 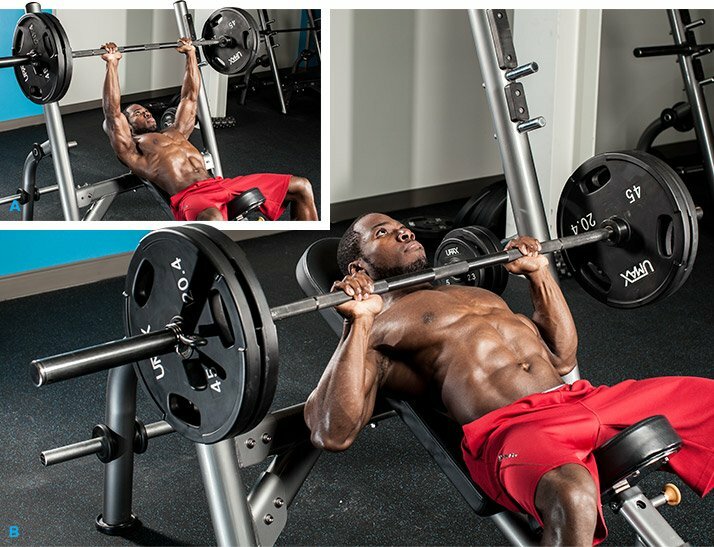 Hence the workout below shows a sample workout for just the bench press. By Week 8 you've tested your maxes twice and completed enough heavy training sets to illuminate your lifting inadequacies. Maybe your deadlift lockout is lacking gusto. Perhaps your bench press starting strength is a tad impotent. Don't worry, even experienced lifters have to combat weak points. You'll overcome them. See them as a dragon to slay, not a hindrance. There are two potential dragons to skewer with your assistance-training lance—the starting dragon (bottom of the lift) and the finishing dragon (top of the lift). Depending on your lift needs, you'll choose your own assistance adventure to develop your assistance programming. This is the beast that slows you at a lift's onset—the one that pins the barbell to your chest, anchors your deadlift attempts to the floor, and buries you inescapably in the squat hole. Attempting to increase tension at the bottom to improve lift initiation requires correction from a keen coach's eye, and is beyond this article's scope. If you think lift setup is an issue for one or even all of your lifts, consider hiring a good coach. For now, let's assume this malady is resolved. Speed and deficit lifts powerfully defeat the starting dragon. Increasing speed allows you to access strength more quickly, providing power that gets the bar moving. 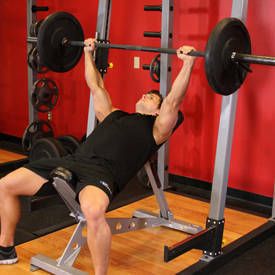 Exaggerating a lift's range of motion morphs the regular range into a "partial" range of motion. Training the joints to work through a range beyond that of the regular lift makes you stronger when returning to the regular lift. It's as if the regular range of motion is a reprieve from the bigger range of motion, allowing you to demonstrate greater strength in the normal range. Increase your speed by employing Olympic lift variations, jumping, and throwing. Power cleans from the floor and from the hang do well to improve deadlift and squat starting ability. Box jumps and broad jumps also boost lower-body power that improves squat and deadlift starting strength. Medicine-ball throws—chest passes, overhead throws, rotational throws—of all kinds improve upper-body power that applies to bench-press speed. If you don't have access to medicine balls, try upper-body plyometric variations—plyo push-ups and upper-body box jumps. Complete your speed training after your warm-up and before starting the day's main lift. Others among us brutalize weights at the lift's onset, only to become stymied halfway toward lockout. The finishing dragon's flames sabotage success. For these folks, the solution is simple: program partial-range-of-motion lifts that initiate just before a weak point. 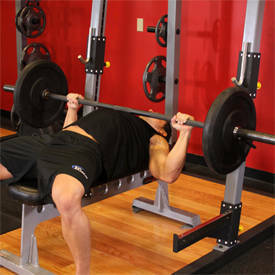 For example, let's suppose your bench press fails at the halfway point. Set up in the power rack with the barbell set on pins that, when you're set up underneath the barbell, your elbows are set at an angle just shy of the halfway point. From here you'll press the bar as violently as possible to lockout and reset on the pins so that you start each rep from a dead stop. Setting up just before the weak point allows you to train through the entire problem area by accelerating through the weak point. Setting up just before the weak point allows you to train through the entire problem area by accelerating through the weak point. Remember to start just below the weakest point rather than starting at exactly the weak point, which doesn't allow you to train the entire problem range. Let's keep the assistance programming simple: Use 3-5 sets of 4-6 reps. Start with 3 sets at the beginning of the training month and progress to 5 sets by the end of the training month. Remember to always use weights that leave a few reps in the tank at the end of each set; this type of training isn't to muscle failure. That's bodybuilding—we're focusing on strength, not size! Strength development requires increasingly stronger stressors, so wave-loading is a great tool for increasing training stress without frying yourself. Analyze your lifts, find your weak points, and slay the appropriate dragon. Focus on lower half of each movement. Focus on upper half of movement. Todd Bumgardner, MS, CSCS, is a strength coach, nutrition coach, and manual therapist in the new York City area.